"Don't worry what others are doing! and purify his or her own heart as much as possible". Horses open your heart. And, when you look and listen through the lens of your heart, you open the doorway to the language and world of feeling. In this land of feeling comes all our emotions, our intuition, our bodily sensations, our sensory information, and our soul's voice; each uniquely rich with their own valuable wisdom. How life works for horses in a herd is by knowing the consciousness of each member within the herd and their environment in order to survive. Where is the lead mare standing? Where is the water and food? Where is the safe ground? What are the weather patterns? Knowing where there might be a predator lurking? Who are their friends? What is the order of leadership? Is it time for play or rest? Sounds like a graced life, no? And, this cannot be effectively managed within the herd if its members are disconnected from their feelings / sensory awareness or connection with each other and surroundings. They prefer to depend on each other. We humans have been taught by example and verbal direction to not be open with most of our emotions. This has caused a cultural crisis in being cut off emotionally for hundreds of years. This has had a cumulative effect of a lot of unexpressed and repressed emotion. We sit on a cultural emotional volcano. And, don't we know it well with more and more people expressing their unfounded judgments, rage and hostility at a moments notice. In the human community we rarely grow-up in an environment of knowing what our other family members are really thinking or Feeling. Much of this is assumed, hidden, or denied. There is a lot of guessing, making things up, projecting, and judging that comes from the fallout of poor relationships with our emotional nature. We learn it is wrong to ask questions. We often don't get the opportunity to practice effective relationship and communication skills. We end up leaving our family systems (herds) not knowing how to deal with our emotional information successfully or responsibly, because it has not been effectively modeled. This has left a significant deficit in our human consciousness. We cannot change this impact on our human culture over night that would be spiritual blackmail. But we can begin to learn from our horse mentors how to unravel this condition one feeling at a time. In working with horses we have the opportunity to see reflected in their behavior just how we are being and feeling. Exploring feelings within the FEEL Reflective Circle, one begins to see if, what they say and what they FEEL, are aligned. The horses communicate with maybe a swish of a tail, pinned ears, or maybe with licking and chewing, sighing and lowering their head. We can trust their honest and instantaneous communication style. When you stand near a horse you are automatically a part of their herd. 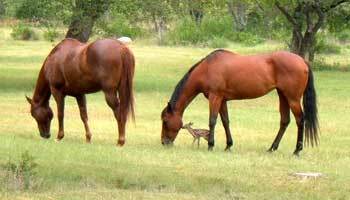 They do not just distinguish between horses and ignore the humans present. 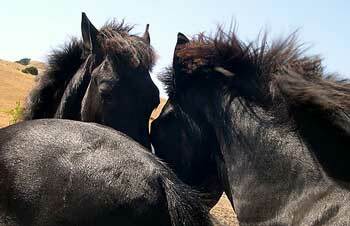 Horses may listen to the other horses first before the humans. Here is where the fun of FEEL exploration comes in, by learning their language and how to listen to the subtleties of that language. 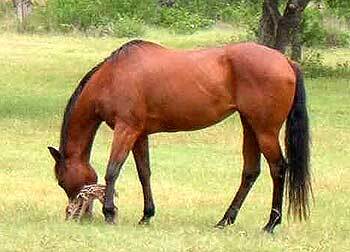 See, if our feeling, speaking and being are not aligned, then we are not dependable and that is a threat to a horse. In this state we appear ungrounded, distracted and untrustworthy. And horses will be horses uniquely when perceiving a threat. They may want to flee, or challenge, or resist what we are asking them to do. And horse owners sometimes wonder why horses won't perform. This is what is meant when so many of the natural horsemanship instructors say, "It's not a horse problem, it's a people problem." Horses have been trying to get our attention for a long time. Finally, we know how to listen. What this means for horse owners and non-horse owners, is we can begin to learn the practices of emotional responsibility horses naturally embody. Our choices and decisions can be governed by more loving, affirming expressions. We can learn to let go of the over tendency of the undisciplined mind that quickly assesses a situation or person without full knowledge. When we look at life through the heart we have the eyes of compassion, trust and patience; qualities that a quickly judging mind cancels out. Horses have this innate ability to not judge. They merely view feeling-behavior and bodily-behavior as useful information. If your breathing increases, to them there is someone feeling fear or stress. It is important to tend to that stressor, not override it. We humans have become all too accustomed to including stress as a "normal" part of living. So many of our stresses are of an emotional cause, the unfinished business of too many miscommunications and misunderstandings that have collected in our hearts over the years. A lot of these stresses are not normal or healthy ways to be living. Every expert in medicine, allopathic or holistic, will say stress related behaviors and patterns are not healthy. Yet, we just accept this mal-adaptation without question. Why is that? We often feel powerless to change. We think there's no time to change. The truth is, often we don't know how to change. Without healthy modeling we are left "tool-less in America" when it comes to our emotional well-being. This process of becoming one of the herd, has us slow down, become more present, because their cues happen within seconds. When humans slow down and calm their breathing, feel from the heart and trust in their bodies communication system, they become at one with themselves and their environment. You begin to feel connected to that energy of, All That Is. Because horses depend on knowing the emotional state of every member of their herd and because they do not judge any emotion as good or bad, the herd is free to tell the truth and deal with their emotions as they arise authentically, responsibly, and completely. There's no stuffing or backlogging emotionally. Horses stay clear and clean, which brings them emotional freedom. And yes, horses feel. Anyone who states differently has not been with horses intimately. Let us put an end to the human arrogance that we are the only species who feels. They absolutely have a full range of emotions. They feel pain, loss, loneliness, abandonment, separation, anger, fear, anxiety, and even depression. They feel the higher emotions of love, caring, loyalty, compassion, and forgiveness. They suffer as we do when being abused. They get scared when they are not understood. They feel loss when a friend dies or moves from one barn to another. They feel the slightest lighting of a fly on their skin. They live in community and enjoy all the pleasures of relationship. We now have an opportunity to lay down the patterns of stress, discontent, and unhealthy ways we contend with or try to override. 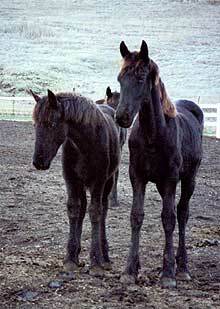 Horses can bring us to that emotional freedom we all hunger for and often cannot access. the client can be brought to a state of greater congruency in a quicker time than many other modalities of self healing and awareness provides, because you receive instant feedback that you can trust more readily from the horses. They also provide something unexpected within their compassionate reflection - they bring us the living experience of unconditional love. We have a long way to go to be living powerfully connected to all that we are, and using all of our abilities in synergistic balance. And, now we can begin creating the safety to be our fully Feeling selves.